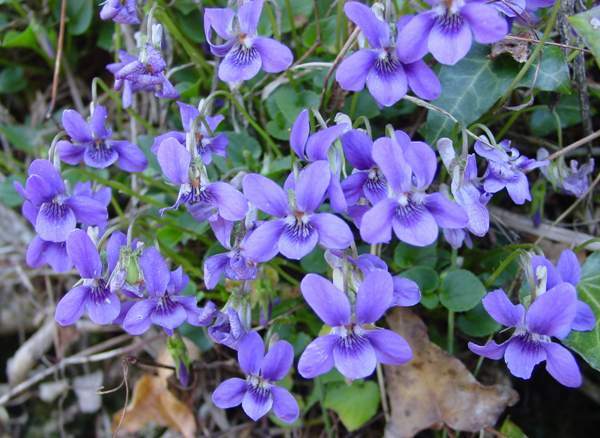 There can be few wildflowers more generally well known than these lovely violets of springtime. 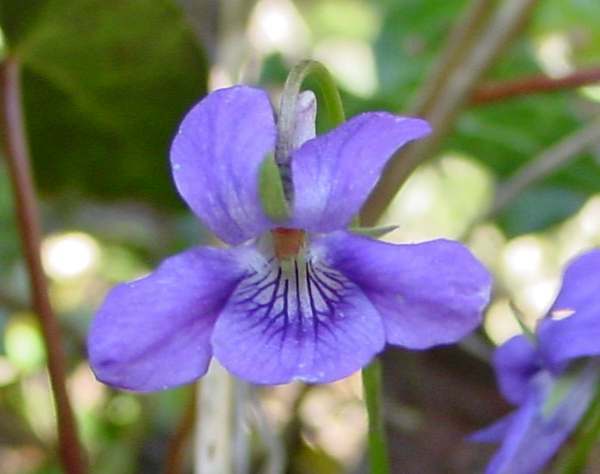 With long-stalked heart-shaped leaves, which are either hairless or only slightly downy, Common Dog-violets produce flowers 15 to 25mm across which range in colour from almost pure blue to deep violet. This perennial plant spreads mainly by means of above-ground runners, which are referred to as as 'stolons' in botanical literature. The flowers have five petals backed by small pointed sepals. A distinguishing feature of the Common Dog-violet is its upturned flower spur, which is much paler than the flower petals (the spur is often white or nearly so) and is notched or furrowed towards its tip. Most commonly seen on roadside banks and woodland edges, Dog Violets have a habit of hiding among other vegetation beneath hedgerows, and unless forming large patches they are not always easy to spot. The Common Dog-violet is indeed very common and widespread throughout the UK and Ireland, where it is by far the most abundant of the violet species. This wildflower is native to most of mainland Europe and parts of North Africa; its range extends into Asia. Common Dog-violets (referred to as Dog-violets because they are scentless and were therefore considered as fit only for dogs) bloom chiefly from mid March to mid June, but occasionally you will see them as early as the end of February and, in shady upland locations, as late as the start of July. Fritillary butterflies make good use of the leaves of all kinds of wild pansies: these are their larval foodplants. Sweet Violets Viola odorata, usually the first violet species we find in the wild in Britain and Ireland, have downy stems and leaves (whereas Common Dog-violet is almost hairless); they grow in woods. 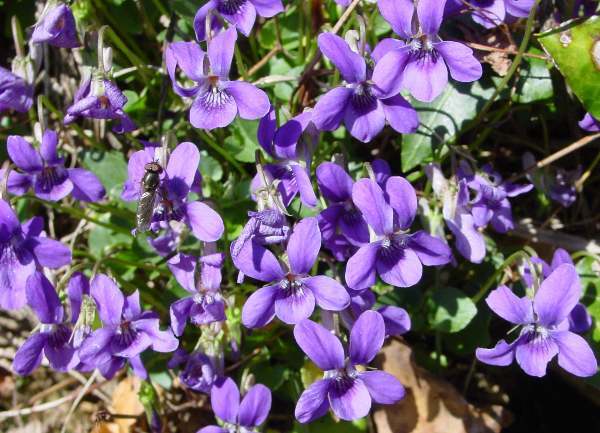 As the name suggests, Sweet Violets have a strong and pleasant scent. The flowers shown on this page were photographed in West Wales.